I'm a fiction novelist, observer of nature and people, gardener, photographer, birder, and traveler. I'm a wife, mother, and daughter. I enjoy many outdoor activities such as camping, fishing, and x-country skiing. 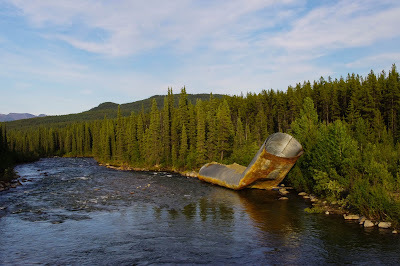 My blog is a sharing of my activities and interests and the experience of living in Yukon Territory in Northern Canada. Canyon Creek is an ordinary stream in ordinary times. 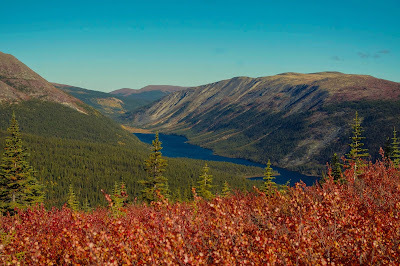 Flowing from Shilsky Lake nestled at the bottom of mountains, collecting water flowing down steep surrounding hills until rushing through a canyon and tumbling out to the Alaska Highway a few miles west of Rancheria Lodge. A large culvert guides the water beneath the highway and onward it runs over a wide rock-filled bed to the Rancheria River. An ordinary mountain stream until Nature turned on her power. 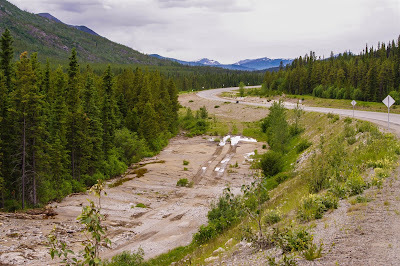 In 2012, after a cool spring in southeast Yukon, warmer temperatures arrived in late May and a record snow pack melted fast as rainstorms continued to hit the area. Rivers were rising to flood stage. On June 8, where the Alaska Highway snakes alongside the Rancheria River and where steep hills border the northeast side, Nature's power struck. Water gushed down the hills, and mud and rock collapsed onto the highway. 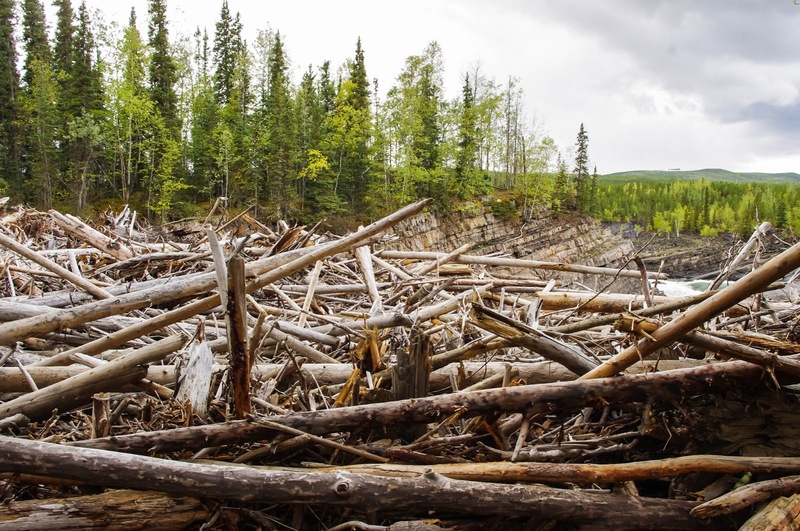 Rivulets and streams grew in size and strength widening ditches, and spilling stone and wooded debris onto pavement. At Canyon Creek, the raging water tore large trees from the creek bank, carried them downstream and dropped them along its path; it cut through the pavement, moved the culvert, and created a large boulder field where the highway once ran; it spilled from the creek bed and torrents flowed downhill along both sides of the highway. Flood overflow from Canyon Creek that is behind me. 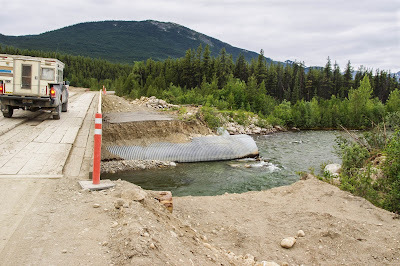 The Alaska Highway was closed between Watson Lake and Teslin, and would remain so for four days while the water receded and a temporary culvert was installed. Boulders, rocks and trees were bulldozed off the highway. Transport trucks waited as grocery shelves in Whitehorse emptied and waited for new deliveries. A cargo plane was flown into Watson Lake to pick up the groceries from the trucks and deliver them to Whitehorse. In Watson Lake, hotels and campgrounds filled up with travelers, and homeowners opened their doors to stranded tourists. 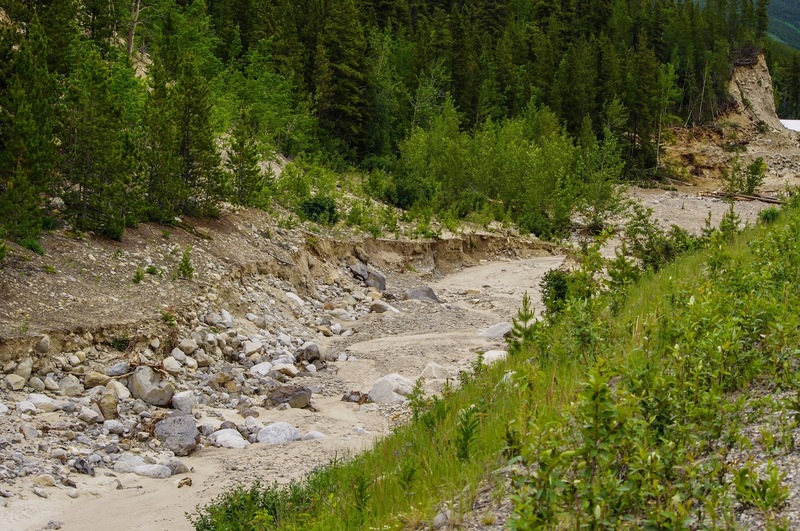 On the same weekend, four washouts were reported on the Nahanni Range Road north of Watson Lake. Running east from the Robert Campbell Highway, the Nahanni Range Road is a vital link for mines. Contractors rushed to install temporary bridges. The rivers and creeks returned to normal water levels. Road and bridge repairs continued throughout the summer; however, a reminder of the flood's strength remained on the shores of the Liard River. At Whirlpool Canyon, a few miles east of Fireside, British Columbia there sits an enormous graveyard of trees piled and shoved together. Their bark peeled by the force of the river and submerged rocks. For one brief time, Nature had shown her power and we were humbled. Hi Susan. Your blog posts are so interesting ... I just love the photographs and the commentary that goes with them. How is your novel going? We haven't caught up for a while.